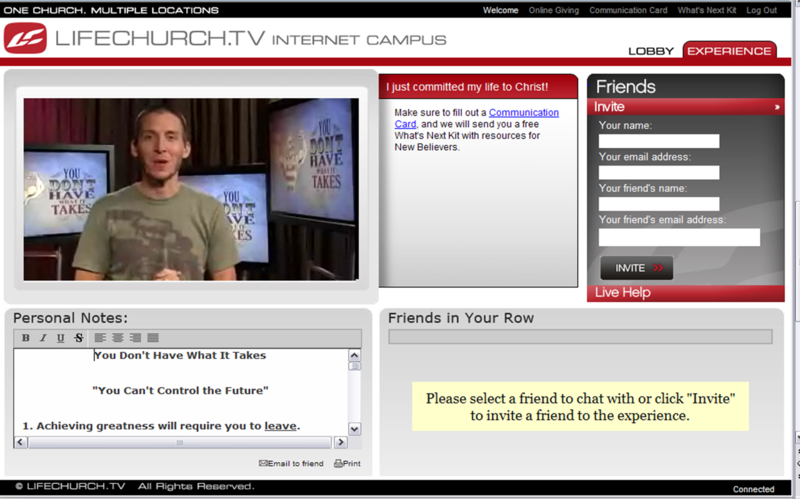 A little while ago, I was in a chat room with an Internet Campus Pastor friend and colleague, Brandon Donaldson. Â He and the brilliant team at Lifechurch.tv were early adopters and trailblazers of the notion that real church could happen on the Internet. Â As we talked about one thing or another, he referred to the two of us as “old school” Internet Campus Pastors. I had to stop and drink that in. Â Can you be “old school” at something that didn’t exist before 2005? 1) Â It’s much more about the Pastoral side than the technical side… Â I tell any church that is even remotely interested in starting an Internet Campus…if you are going to put your messages out there, chat about them, and allow prayer requests, you have to have a dedicated Pastor available to help shepherd the digital flock. Â Sometimes my inbox resembles the online prayer scene in Bruce Almighty…but I consider it a privilege to pray and care for people around the globe. Â Â Many churches don’t start Internet Campuses because they don’t have the right “technology” person to lead it. Â The tech will take care of itself. Â Find a person whose Pastoral heart beats for people he may never meet physically but loves just the same. 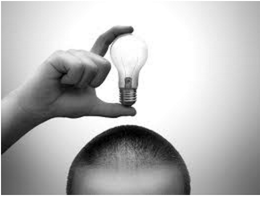 2) Â Your motives will be questioned… Â You will be criticized, ostracized, analyzed, and unfairly questioned. Â Â People will challenge your salvation and say that your ministry is worthless. Â Soldier on. Â My heart beats for the lost…even if they are in prison, sick, phobic, or otherwise unable to attend a physical campus. Â That’s why we’re here. 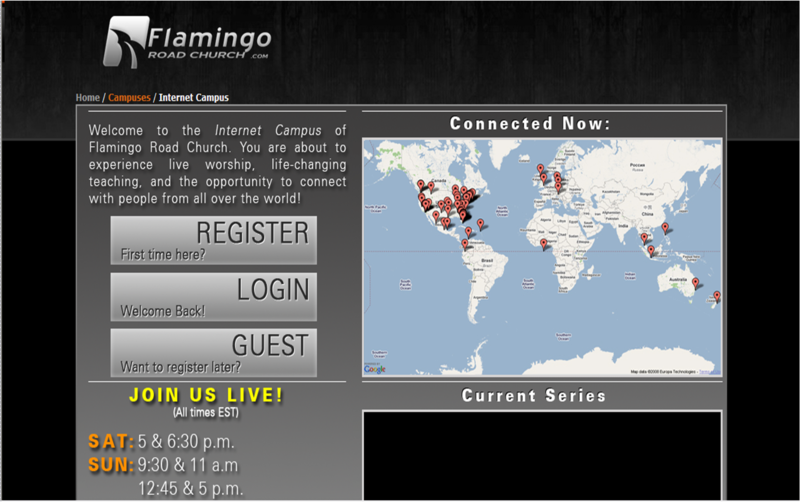 Â It’s all about the vision God’s given us at Flamingo Road through our Lead Pastor, Troy Gramling. 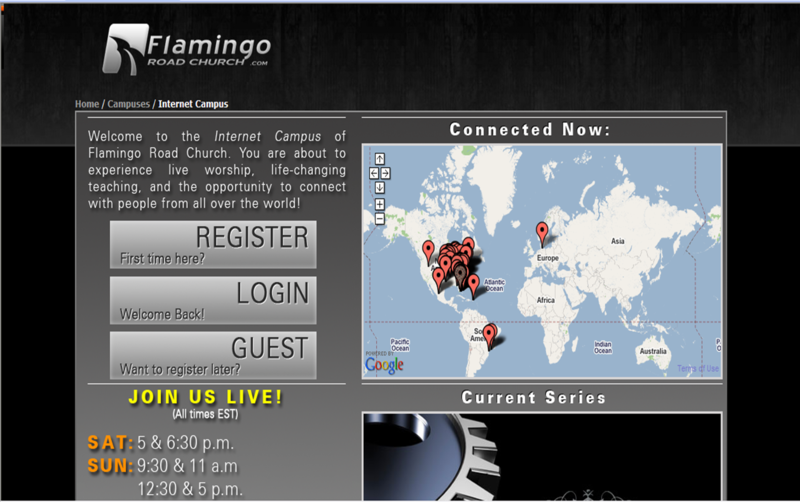 Â Â We believe God has called us to have an Internet Campus…and we would be disobedient to do otherwise. 3) Â Learn from everyone… I love talking to brand new Internet Campus Pastors. Â Â They are packed full of fresh ideas…new thoughts… and brilliant strategies… God gives them a different angle or a varied look at the internet community that we’re all working to save from hell. Â No matter the size of the church or its Internet Campus, Â I can always glean something new that may help us in our journey. Â In turn, we are always ready to help anyone just putting their digital stakes in the ground. I know that reflecting about Internet Campus Pastors is a little like writing a biography of a baby still in the womb. Â There’s still so much to do and explore. Â I can’t wait to see what God has planned for iCampuses… real churches seeking real people with real hearts in virtual space. First hour: Weâ€™ll discuss new media/technology – specifically Twitter and Facebook and how they can be used for ministry purposes. Iâ€™ll share 4 key realities of these new technologies. *** I’ve added a 4th since the last one. Weâ€™ll then break for lunch and encourage people to go eat somewhere close by with someone they donâ€™t know and get to know them over lunch. The post-lunch part weâ€™ll discuss social justice/what breaks my heart and the heart of God – as well as have time for Q & A.
I think the “Mix & Mingle” Lobby Chat is fascinating and am amazed to see how God uses it. 2 weeks ago, over 50 people prayed to receive Christ through LifeChurch.tv’s internet campuses – that’s more than most churches see in a year. No, that’s not Craig Groeschel. They had an awesome guest speaker. Of notice in this picture is their “Give Online” area of the screen. At the botton left, you can follow the message notes. Great experience. 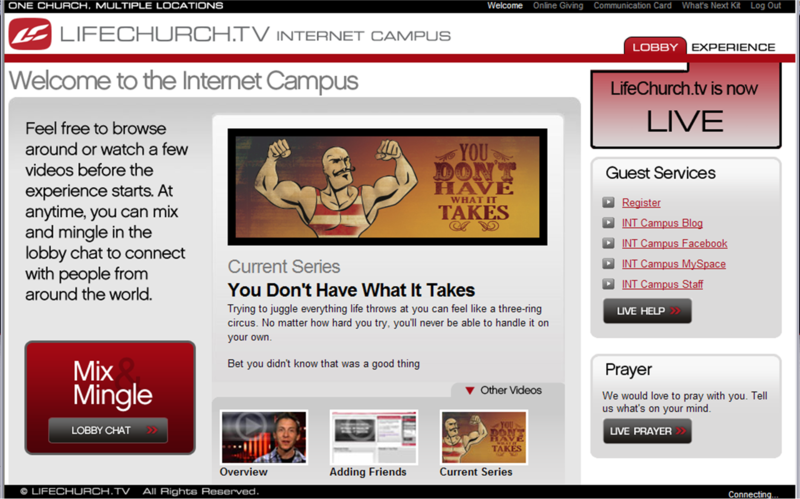 Most people think of LifeChurch.tv when they think of an internet campus. 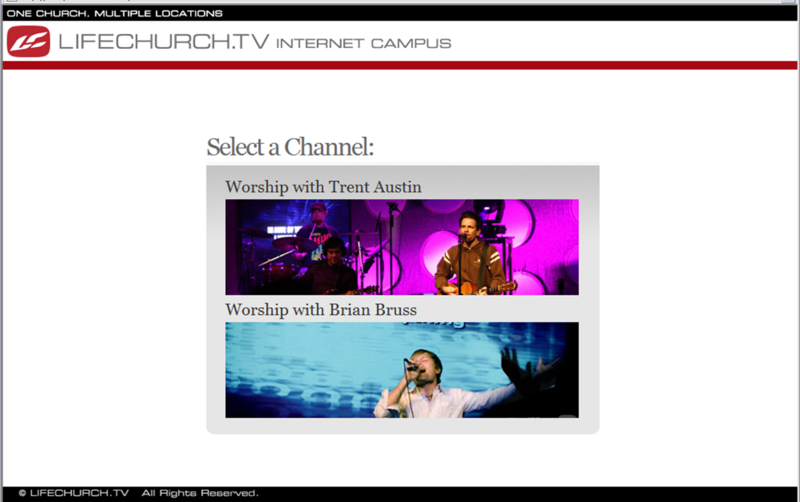 Above, LifeChurch.tv always let’s you choose between 2 different worship leaders. This is cool, but I have an issue. What happened to Stephen Cole?? Stephen Cole is my favorite worship leader at LC and I’m thinking about starting a petition to bring him back as an option. He rocks! 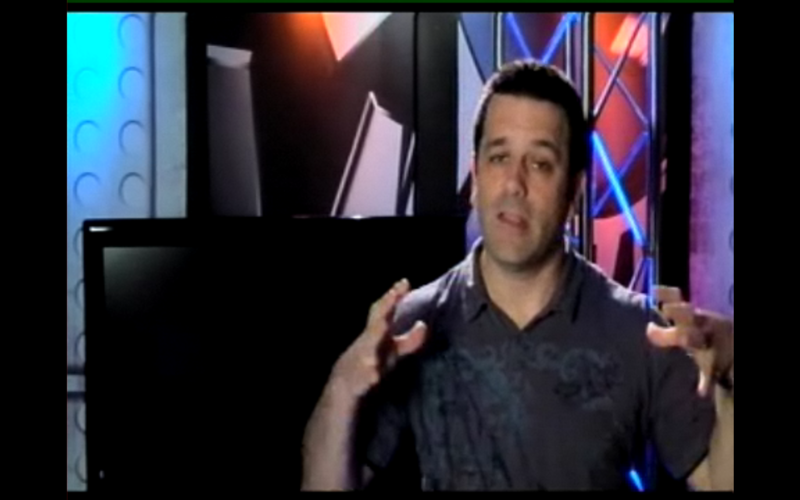 Above is LifeChurch’s Internet Campus Pastor Brandon Donaldson. I need to get to know that dude. Above was a screenshot taken after one of their morning services. The red dots show you who was watching around the world! Flamingo was having a baptism that day (they had a great video announcment about it – very cool). Want to participate in baptism? Just text the word: BAPTISM. Folks, we are literally watching the face of Church change before our eyes. The thing that impressed me the most about my south Florida friends is that they know how to make church fun. 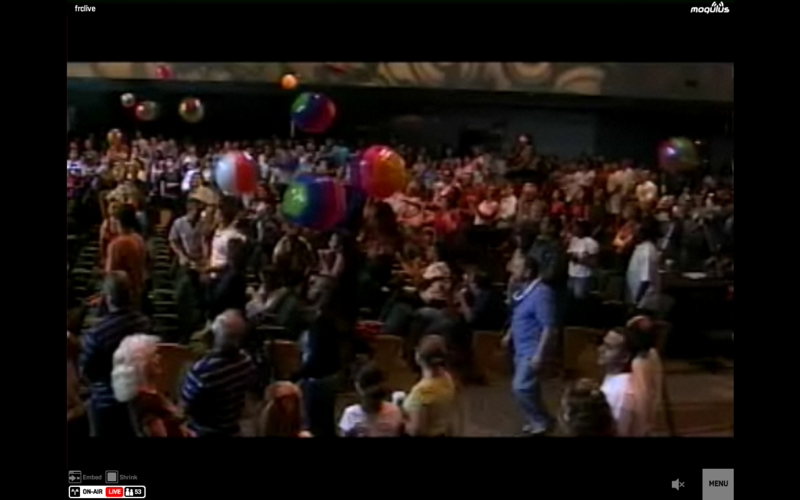 This is a screen shot of beach balls being tossed around the auditorium. You’d have to be there to understand. 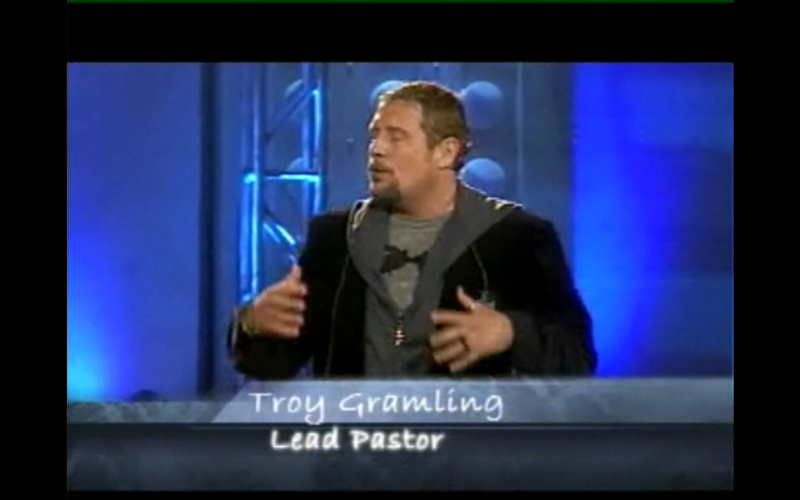 Above is Flamingo’s Lead Pastor, Troy. Flamingo was truly the highlight of my morning and a wonderful surprise. There is talk of the Church 2.0 Local Forum in Miami being held at Flamingo Road Church – shhhh! 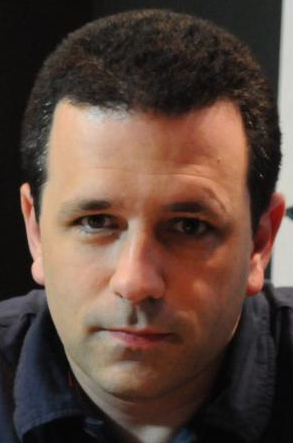 Above is Flamingo’s Internet Campus Pastor, Brian Vasil. 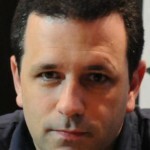 I was introduced virtually to Brian through my friend, Tony Steward via last week’s LifeShare. I was introduced to Flamingo Road’s Internet Campus through my friend, DJ Chuang. More to come about these and other internet campuses this week on this blog! So… what are your thoughts? Does the thought of over 50 people praying to receive Christ via the internet freak you out? Do you praise God? Both? 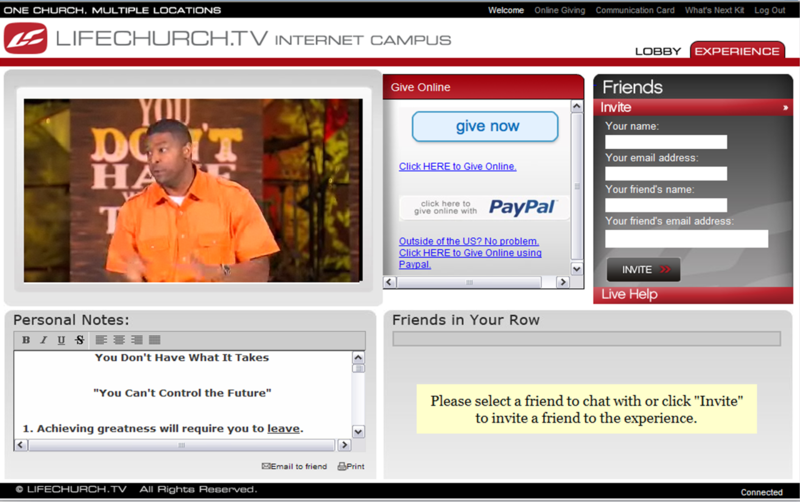 Is your church considering an internet campus? Are you philosophically opposed to one? Let me hear ya.